The Surface Studio's hardware configurations vary greatly. Microsoft’s long-rumored desktop PC is finally real, and the Surface Studio all-in-one is a seriously impressive piece of kit on paper. This stunning flagship unapologetically attacks Apple’s 5K Retina iMac while flying the flag for Windows 10’s latest, greatest features—for a range of Mac-like prices, depending on the specific hardware configuration you demand. Before we dive into available Surface Studio configurations, let’s recap some characteristics common to all the models, starting with that screen. The Surface Studio packs a 28-inch, 4500x3000-resolution display into an astonishingly thin 12.5mm panel carved from forged unibody aluminum. 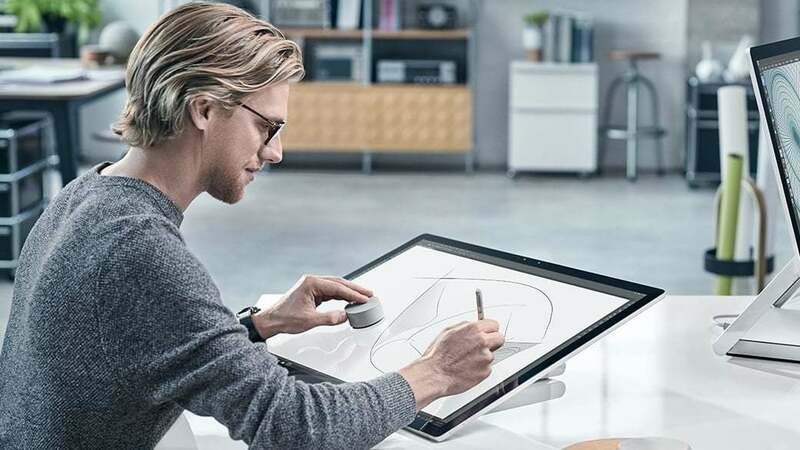 The monitor’s rife with professional features such as 10-bit color depth, a DCI-P3 to SRGB color toggle, the ability to tilt the screen to a drawing-friendly 20 degrees, and touch capabilities with 1,024 levels of pressure sensitivity for the Surface Pen. The Surface Studio’s display is no joke and ready for business. But this article’s focused more on what’s inside Microsoft debut desktop. All configurations support 802.11ac Wi-Fi, Xbox wireless controller support, and Bluetooth 4.0, with the new Surface mouse and keyboards connecting over the latter. Port-wise, you’ll find SD card support, a 3.5mm audio jack, mini-DisplayPort, and four USB 3.0 connections. 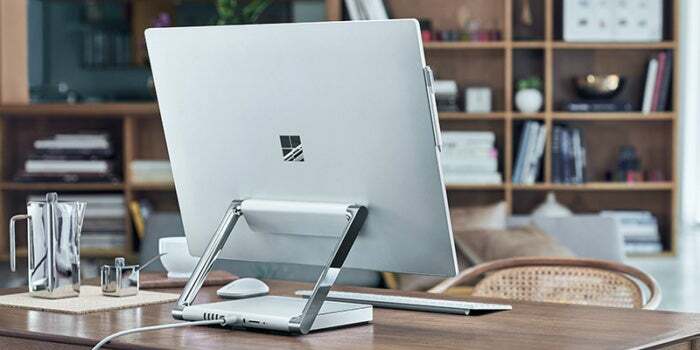 Every Surface Studio configuration also packs stereo 2.1 speakers with Dolby Audio Premium support, and a front-facing 5MP camera capable of 1080p video and Windows Hello biometric authentication. Panos Panay, Microsoft’s Corporate Vice President of Surface Computing, adjusts the Surface Studio’s display settings. The rest of the hardware varies based on how much you want to pay, and frankly, isn’t quite as luxurious as the Surface Studio’s exterior. Microsoft’s all-in-one leans on last-generation Nvidia graphics and 6th-gen Skylake Intel Core processors rather than newer, 7th-gen “Kaby Lake” chips (though to be fair, Kaby Lake is only available in laptops thus far). All of it should be more than powerful enough to handle content creation tasks, but the aging hardware nevertheless takes a wee bit of the luster off the Surface Studio’s appeal. That said, a 27-inch Wacom Cintiq professional display with a pen costs $2,800 by itself, and that’s with a far lower 2560x1440 resolution. The Surface Studio packs massively more pixels and a whole PC. The entry-level Surface Studio starts at a $2,999 but packs mostly modest internals, with a 2GB Nvidia GTX 965M GPU, a quad-core Skylake Core i5 processor, a 1TB “rapid hybrid drive,” and 8GB of RAM. That loadout’s probably more than fine for casual image and video editing, but if you tinker with heavier tasks for a living, you may want to step up to a burlier model. The Surface Studio being used with a Surface Pen and Surface Dial. 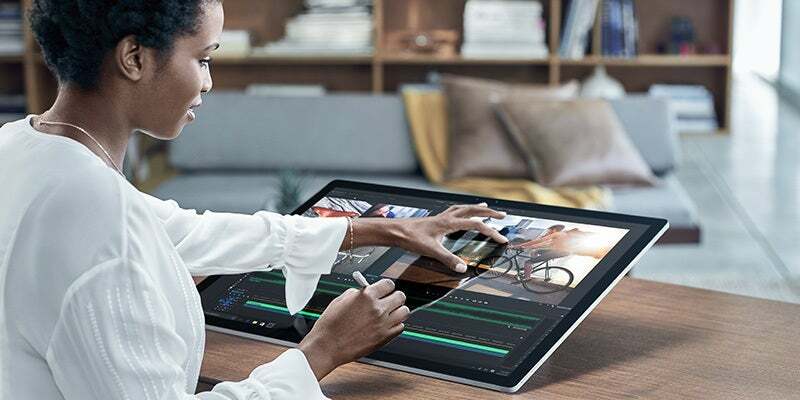 The $3,499 Surface Studio upgrades the processor to a Core i7, complete with the i7’s crucial Hyper-Threading feature than can help you churn through video editing tasks that much faster. It also doubles the onboard RAM to 16GB. Finally, the top-of-the-line Surface Studio configuration keeps the Core i7, upgrades the graphics to a much more potent Nvidia GTX 980M, and doubles both the RAM and available storage to 32GB and 2TB, respectively. The cost? A staggering $4,199, and you’ll still need to spend another $100 on the radical Surface Dial to use Microsoft’s all-in-one as it’s meant to be used. Like I said: The Surface Studio’s a true iMac challenger indeed. You can preorder Surface Studio now, with an expected ship date of December 15—though we’d recommend waiting for independent reviews before plopping down that much cash.